A few months ago I caught sight of a dazzling poster in the tube station which stopped me in my tracks. It had loads of elephants running around in luscious green countryside flanked with wild, exotic plants and splashed with monsoon rain. I love elephants, they are my favourite animals. Big, gentle and with loooong memories. I’m always amazed when I see programmes about them returning to their elephant graveyard when they’ve never been before. Some kind of primordial collective memory lodged within their DNA…who knows? So, it turns out the poster was for an exhibition at the British Museum of paintings from the palaces of Jodhpur which have never been seen abroad. 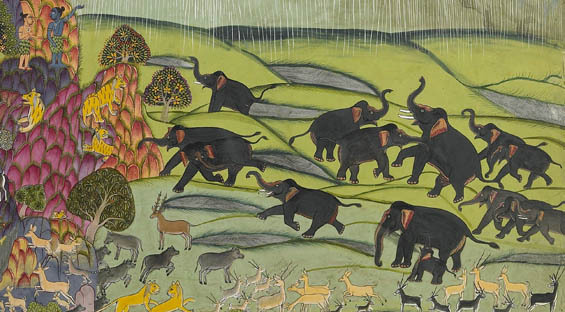 I confess I’ve never been an afficionado of Indian art, although I’ve been to several exhibitions at the British Museum and the V&A over the years and am familiar with the Indian artistic style. But the image in the poster (see above) wouldn’t leave my mind, so I dragged my family to see it. And it was just gorgeous. The artistic sensibility, style and fresh colours used were so different to what I’ve always assumed was Indian art (but then India is a nation with a vast history and many different artistic traditions so I shouldn’t really have been surprised). What really struck us was the similarities in composition and aesthetic to Japanese prints and paintings, especially ukiyo-e and nihonga. You would never think to compare the two culturally and aesthetically diverse countries. India always seems so vibrant, noisy and colourful whereas Japan sits back in quiet contemplation with sombre and mute colours. A step back as opposed to India’s rushing forward. But every single picture resonated with similarities, for example the way the waves in the Indian Ocean was represented was exactly like the stylized patterns often used in kimonos and chiyogami. It was unbelievable and made me feel that art and beauty truly is universal. The exhibition has been extended to 11 October 2009 so you have no excuse to miss it. Go and see it now!